The DAYTONA 100 course is North Florida's first point-to-point ultramarathon, spanning over a dozen cities, four counties, and stretching from Atlantic Beach (Jacksonville area) 100 miles south to Ponce Inlet, a gem of a town located on the southern tip of a secluded peninsula, just 10 miles south of Daytona. From the eclectic feel of Jacksonville and Neptune Beaches, through the upscale communities of Ponte Vedra / Palm Valley, and into America's First City, St. Augustine, the first 35 miles of the DAYTONA 100 offers unparalleled views of the ocean, multi-million dollar estates, and a large dose of history. The "middle section" of the course -- from St. Augustine to Beverly Beach -- features some true laid-back "Florida" beach towns, including St. Augustine Beach and the beaches of the Palm Coast. It also features the luxe community of Hammock Beach. Finally, the last 33-34 miles of the course pass you through Flagler Beach and Ormond Beach on your way down to the finish. Once you reach Daytona Beach Shores (Mile 88.5), you will run the next 4.5 miles on the beach itself, exiting it briefly in Ponce Inlet for one last aid station, as well as to circle the world-famous Ponce Inlet Lighthouse (pictured above). You will then return to the beach at Mile 98, and -- for the first time in the entire race -- actually run north for the final two miles. You will also actually be on the section of beach where the great Daytona car races took place decades ago. 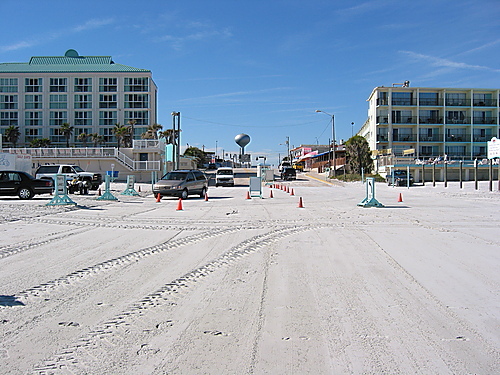 The race finishes in dramatic fashion right on the beach at the very spot where the old Daytona auto races exited the beach onto Atlantic Avenue: the "north turn." Today, one of Florida's "10-best beach bars," Racing's North Turn, occupies that spot on the beach, and will host our finish line and Sunday's award ceremony. On Saturday, November 7, 2015, at 6:00 am -- sharp! -- the Inaugural Edition of the DAYTONA 100 will commence from the large LA Fitness parking lot in Atlantic Beach (985 Atlantic Ave.). The first mile is run on the sidewalk on Atlantic, until you reach the ocean and begin your 99-mile journey south! The first 5 miles (through Jacksonville Beach) will be run on First Street, a runner-friendly side-street (popular with local runners/cyclists on the weekend) that sees little to no vehicular traffic. Once you reach eclectic Jacksonville Beach, the city -- and the sun -- will be just waking up, and you will likely be treated to a gorgeous North Florida sunrise over the ocean and the Jacksonville Beach Pier! Once you run through Jacksonville Beach, you will then briefly make your way down Ocean Avenue and Duval Rd -- right on the beach -- until you reach your home for a while, Ponte Vedra Boulevard. This street is generally gorgeous, with minimal traffic and some of Florida's most expensive homes (which are more accurately described as "compounds" or "estates"), as you run south through Ponte Vedra Beach. You will pass right by the world-famous TPC at Sawgrass golf course (that the PGA Tour visits in its "Florida swing" each February). At about Mile 13, Ponte Vedra Blvd. bends inward to merge with A1A. Before that, however, you will reach Checkpoint / Aid Station #1 at Mickler's Landing Beach Park (Mile 12.8) There, you will start running on the beach itself for the next 14.7 miles, all the way down to Usina Beach (Mile 27.5). The beach is pristine, a good/firm running surface, and -- in November -- will basically be yours alone as you enjoy a likely tailwind and gorgeous ocean views!! Checkpoint / Aid Station #2 will be at Mile 22, right on the beach. When you reach Checkpoint / Aid Station #3 at Usina Beach (about Mile 27.5), you will exit the beach, pass over the Frances & Mary Usina Bridge, which deposits you in downtownHistoric St. Augustine (Mile 32). St. Augustine, founded in 1565, is recognized as America's Oldest City. The DAYTONA 100 course travels right past the historic Castillo de San Marcos, and also through the town center, where locals will eagerly await your arrival, cheer you on your way, and (likely) have a cold one in your honor! After briefly touring St. Augustine, you will head over the Bridge of Lions out of St. Augustine, and head back to the beach communities. You'll pass through St. Augustine Beach (which will host Aid Station 4 (Anastasia Plaza). You will continue south through Crescent Beach before reaching the Mile 50 Checkpoint / Aid Station #5 at the River to Sea Preserve, which will also be the start line for the DAYTONA 50. As you continue to make your way south, this section will be run through Florida's famed Palm Coast, including Beverly Beach and Hammock Beach. Additionally, in this section, you will start running on the Flagler Beach to Marineland Trail, a paved pedestrian/cycling trail that mirrors A1A all the way down past Flagler Beach (the trail runs from Miles 54-72). You will reach the Mile 60 Checkpoint / Aid Station #6 at Varn Park (Mile 61), right on the ocean. Then you will continue towards Hammock Beach. For you golf aficionados, Hammock Beach's course hosts an LPGA event every year, and is one of the courses that rotates to host the U.S. Open. Once you reach Flagler County, charging hard to Ormond Beach, you have most of the "road" in your rear-view mirror. You will pass directly through Flagler Beach (around Mile 70), a quintessentially-"Florida" laid-back beach town which offers amazing and unobstructed ocean views. Just past "downtown" Flagler Beach, you will arrive at the Mile 70 Checkpoint / Aid Station #7 (Gamble Rogers State Park). You will then press on for another ten miles until you find yourself in Ormond Beach and the Mile 80 Checkpoint / Aid Station #8. Once you run through Daytona Beach and enter Daytona Beach Shores, you now have run over 88 miles. But you are in for a treat: you can now take a break from all that asphalt, as the next 4.5 miles are run on the beach itself! Your crew will have many access points to tend to your needs; all you need to focus on is continuing to move, and enjoying the incredible scenery, the ocean, and the moonlight. Many of you will also experience the sun rise during this section! For those of you who have not actually been on this stretch of Florida beach, it is pristine. The beach itself is the perfect running surface. This is not the "loose" sand of Miami or California; rather, it is much-more akin to running on a rubberized track. Continuing on, you will exit the beach at Toronita Ave, and once you get up the ramp, you will be at the Mile 90 Checkpoint / Aid Station #9 at Toronita Ave Park in Wilbur By The Sea (Mile 93.5). You are now just steps away from the last town on your tour of North Florida: Ponce Inlet! ponce inlet to racing's "north turn"
As you reach Mile 94, congrats, you are now in Ponce Inlet, the last town of your journey! You will exit the beach for five miles, until you reach the majestic Ponce de Leon Inlet Lighthouse at Mile 97.5! Painted in the same hue as the Golden Gate Bridge, the Ponce Inlet Lighthouse is the tallest lighthouse in Florida (175 feet) and one of the tallest in the entire country. After you circle past the lighthouse, you will once again hop on the beach for your last two miles! Your incredible journey comes to an end on the beach at the same spot where the old auto racers used to exit the beach, right in front of the famed "Racing's North Turn" Beach Bar and Restaurant (and the site for the post-race party / awards ceremony on Sunday morning!! Congratulations!! Now kick your feet up and enjoy your amazing accomplishment!!! You are one of the first people ever to run from Jacksonville to Ponce Inlet!